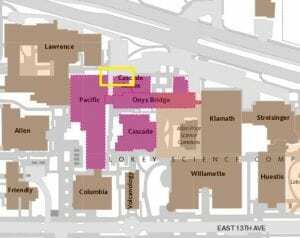 For the Pacific Exterior ADA improvement project, starting on Tuesday, August 14, Delta Construction will have equipment located near the sidewalk immediately adjacent to Pacific Hall at the service drive on the north east side of the building. Workers will be engaging in demolition and construction on the new sidewalk, and there will be saw cutting and noise related to demolition from 8/14 thru 8/17. On the following Monday and Tuesday (8/20 ad 8/21) the new ADA cement sidewalk will be installed. The sidewalk area will remain closed off to carts and heavy equipment moves thru 8/27 while the concrete reaches full strength. NOTE: The driveway will be blocked however, NO replacement of pavement is being done at this time due to budget restrictions. Please use alternate entries to the building during this time, or coordinate any needed access thru Design & Construction Owner’s Representative Jana Gerow at 541-346-8317, or Facilities Engineer Sarah Follett at 541-346-8264. Please direct any questions or concerns you may have to them.